Located at a distance of about 1,600 light years, The famous Orion's SWord contains the Orion Nebula complex (M42, M43) as the brightest diffuse nebula in the sky. To the north (left) the bicolored Running Man emission and reflection nebula (NGC 1977) is placed. The past decades of research on the Orion Nebula have revealed that the visible nebula, M42, the blister of hot, photo-ionized, luminous gas around the 4 hot Trapezium stars, is only a thin layer lying on the surface of a much larger cloud of denser matter, the Orion Molecular Cloud 1 (OMC 1). The age of this cloud is at several million years. The origin of the rich colors are from the H-alpha, H-beta and O-III emissions. North is left. 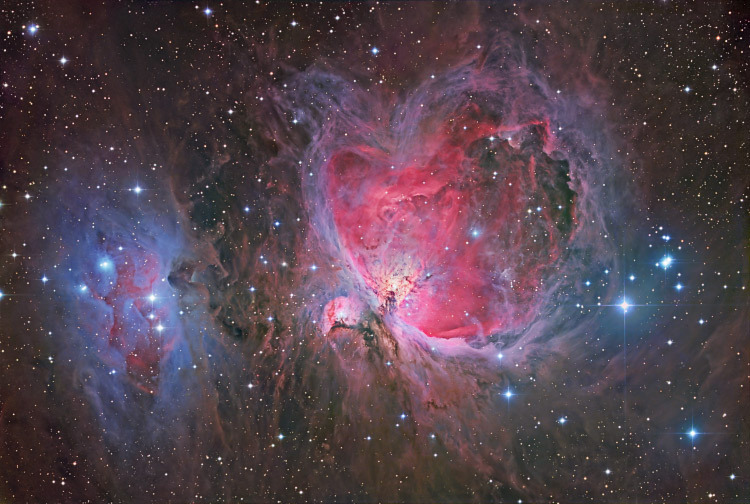 Find a close-up on M42 and M43 here.